EGST is a Christian institution that exists to equip Christ-like women and men through theological and related studies and to stimulate research for the service of Church and Society in Ethiopia and beyond. Currently, EGST offers the following programmes to which we invite you to apply. 1.1.The Post-Graduate Diploma in Biblical and Theological Studies (PGD) is open to students holding a first degree in a subject other than theology from with a minimum Grade Point Average (GPA) of 2.5. 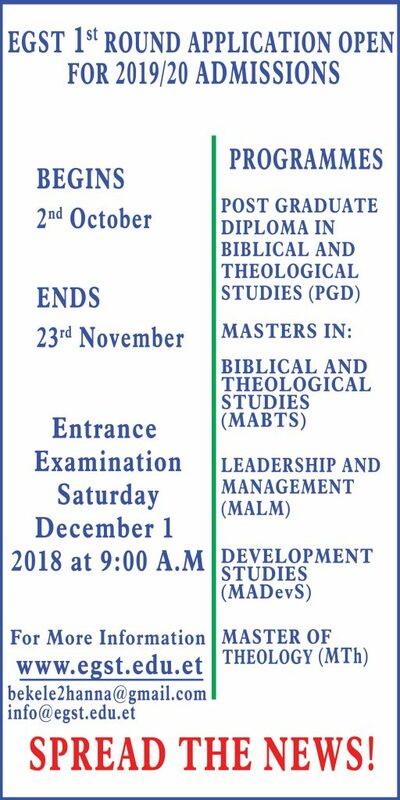 1.2.The Master of Arts in Development Studies (MADevS) and Master of Arts in Leadership and Management (MALM) programmes are open to students holding a first degree in Theology or in subjects other than theology, with a minimum Grade Point Average (GPA) of 2.5. 1.3.The Master of Arts in Biblical and Theological Studies (MABTS) in the areas of Biblical Studies, Theological and Historical Studies, or Mission and Applied Theological Studies, is open to students holding a first degree in theology with a minimum Grade Point Average (GPA) of 2.75. 1.4.The Master of Theology (MTh) is a one-year research degree open to students holding the MDiv, MABTS or equivalent post-graduate theology degree, with a minimum Grade Point Average (GPA) of 3.3. 2.All applicants are required to take IELTS or equivalent English examination to demonstrate English proficiency. 3. All applicants will be required to sit an entrance examination to demonstrate biblical and theological competence. 4.Application deadline is Friday, 23 November 2018. 5.Entrance examination will be held on Saturday, 01 December 2018 at 9:00 A.M.
6.Application and reference forms may be collected from the Registrar’s Office as of 02 October 2018 or can be downloaded from EGST website: www.egst.edu.et. An application fee of 100.00 ETB is required. NB: Applications are considered only from recognized institutions.